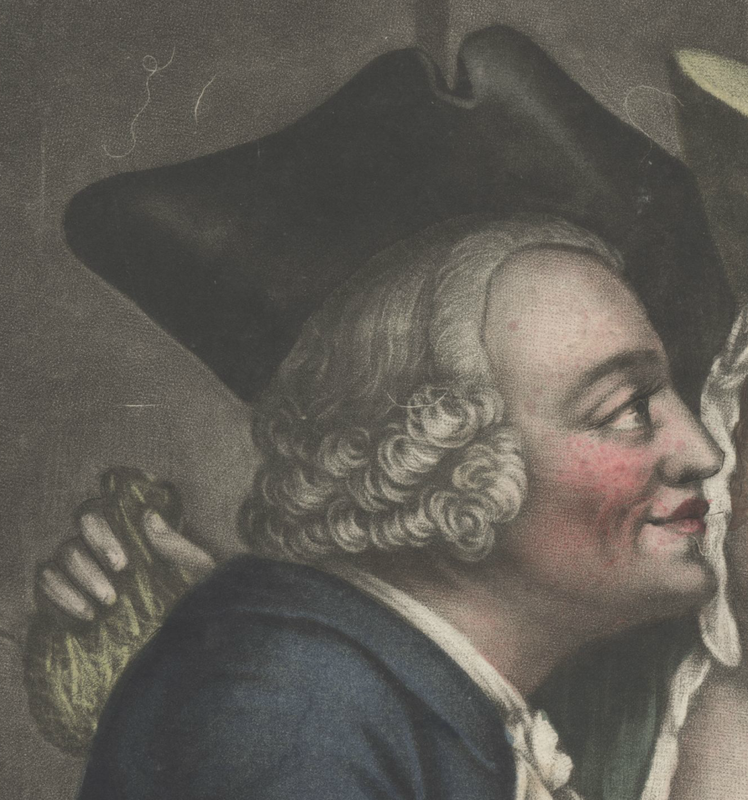 "The Knowing One taken in," artist unknown, c.1760, Walpole Library. Jack Tar is being taken in by a woman of ill-repute. This is not the first nor the last time this will befall a hapless sailor. 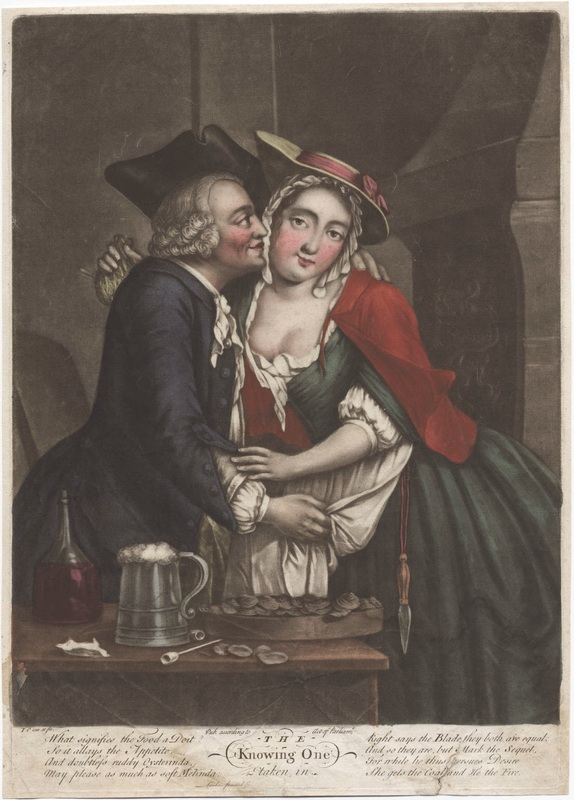 As he leans in for a kiss, she lifts his purse to make a tidy profit. Jack wears a rather nice set of slop clothes for his shore leave. An untrimmed black cocked hat, worn reversed, is nearly tipping off the white locks of his bob wig. His dark blue jacket with its cloth covered buttons sports a collar. Beyond that, we can see a neatly tied and clean white neckcloth. Judging by the white peeking out from behind the lapel of his jacket, we can safely assume he wears no waistcoat. At the small of his back is a button topping the vent of his jacket, and in line with that is a long flap pocket that runs along his waist. 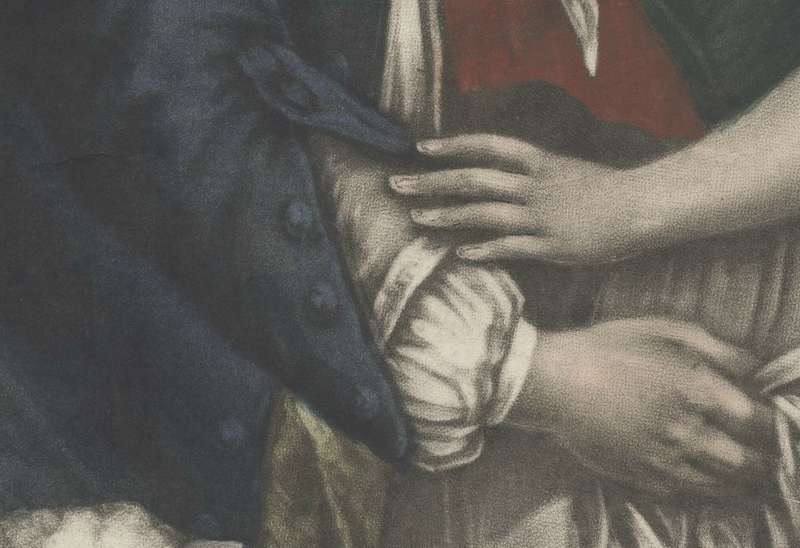 A close look at the mariner's cuffs (complete with matching blue cloth covered buttons) reveals a detail we've seen before: a white strip of fabric running across the open cuff. Perplexed as I was by this, I turned to an expert: Neal Hurst. Neal is a Colonial Williamsburg trained tailor, a research fellow at Winterthur, and an all around 18th century clothing guru. When I showed him the above detail, Neal remarked "I have only ever seen this in Banyans before. They are like half sleeves that start just below the elbow and then end at the wrist." He went on to theorize, as I also suspect, that this may have been to protect the shirt beneath from the tar and grime that comes along with shipboard work. Considering the sailor's fad of leaving the cuffs of their jackets open, this seems to be a solid theory. Neal mentioned that "there is also a hunting suit at Febreig Hall in Norfolk UK with false sleeves in the interiors," but that "I've seen it on maybe three garments. You see true false sleeves in the nineteenth century."